I don't know about you, but to me, the fact that Christmas is only 35 days away is both exciting and scary. I always love a few new sparkly pieces to wear over the holidays but I know that buying gifts for others is the priority and staying on budget is a challenge. The holiday makeup palettes were stunning. 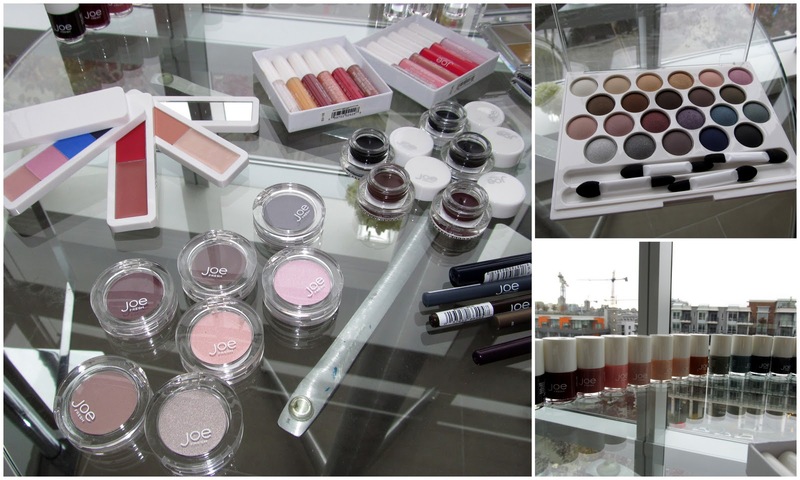 I had no idea that Joe Fresh makeup was of such great quality and the colors were beautiful. To allow us to see all of the holiday products PCHome and Joe Fresh had to offer this season, the penthouse in False Creek's Kayak building was decorated solely with these pieces. Aside from it being obviously stunning (the view? I mean come on), the holiday decor resulted in such a cozy and inviting atmosphere that a few of us bloggers were tempted to move in. 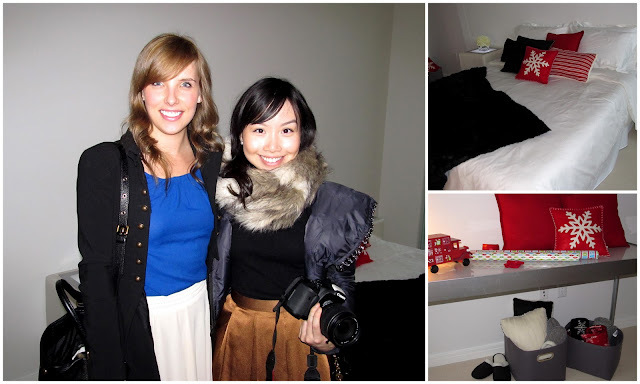 I ran into Jen (pictured above) while exploring all of the goodies in the bedroom and closet and Olivia (below) while drooling over the makeup. I loved that all of the Joe Fresh clothing was hanging in the closet because for some reason it was easier to pretend that everything was in my closet look at. The men's, women's and kid's collections were all of really high quality and the colors will be perfect for winter. If you're like me and looking to finally start decorating your apartment for Christmas like a grown up or want to get dolled up for the holidays without breaking your holiday budget, Super Store will be the place to shop. I think my favorite part is that I can walk in and buy a Turkey and a pair of gold sequin shorts at the same time. Amazing. i love joe fresh! i remember when the merchandise first came to superstore (i'm originally from vancouver island, so duncan was the nearest location) & all the girls i knew were (and still are) going crazy over everything. i love their polishes! for the price of ONE OPI polish you can get three joe polishes. perfect & such a good deal! 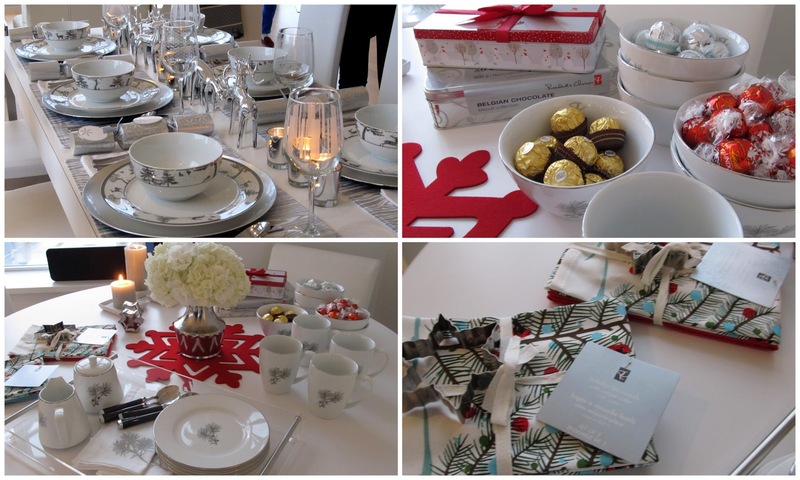 The Joe Fresh holiday collections look great, thanks for posting. I will definitely be checking out the Joe Fresh store next time I'm downtown. Aw, love the photo of you & Jen! So cute! And Joe Fresh is amazing lately... I have had to prioritize so much! I got the tweed jumper and the lace skirt, but seriously need to add in some of the sequins! I love the black sequined striped shirt, and you mentioned sequin shorts?! I def did not see those in my store but they sound amazing!! looks like so much fun, I love those little red flats and of course all of the sparkles...and you are looking just beautiful with your hair that color Melissa, love it! I absolutely love when Christmas time rolls around. Buying people pretty presents is one of my favorite things! I love all the holiday decor! This is my first Christmas on my own-I can't wait to decorate my place and make it all festive. The make up and shoes are what I am immediately drawn to. Look at all those shades! It doesn't hurt that Joe Fresh's packaging is so clean and simple. i'm a joe fresh lover! I like the tableware - surprisingly!! Joe Fresh continues to pleasantly surprise with stylish gear and great prices. Good stuff.